Most f1ies imitate some stage of an aquatic or tenes-trial insect. Because insects are an important food at some time in the lives of virtually all gamefish, it is easy to understand why t1ies are so effective. The majority of flies appeal to a fish's sense of sight, so they work best in relatively clear water. Some flies make popping or gurgling sounds, so fish can locate them even in murky water. Dry flies - These flies imitate the adult forms of various aquatic insects such as mayflies, caddisflies and stoneflies. They are designed solely for fishing on the surface. Wet flies - Most wet flies resemble drowned adult insects, insects just prior to hatching, or baitfish. Some bright1y colored patterns work simply as attractors. Wet flies are fished below the surface. Nymphs - These flies mimic the immature stages of aquatic insects. They are intended to be fished underwater or in the surface film. Streamers - The elongated shape of a streamer resembles that of a baitfish. Streamers are usually fished underwater, but a few may also be fished on the surface..
Bugs - This category includes hard-bodied, hair and sponge bugs. 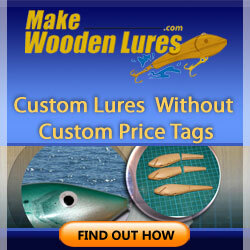 These lures imitate mice, frogs, baitfish or large insects. Some draw strikes by splash and noise and resemble nothing specific in a fish's diet. Bugs are fished on the surface, or pulled b e-neath it and allowed to float back up. Other flies - Egg flies imitate trout or salmon eggs and are fished underwater. Terrestrials mimic land insects like grasshoppers, crickets, ants and beetles. Some are fished underwater, some on the surface. Trolling flies resemble baitfish and are generally trolled in deep water. Yoh can also buy flies that imitate coTTon foods, like leeches and crayfish. Most types of flies work best when attached with a Duncan loop (page 12), but dry flies are more effective when tied on with a dry fly clinch (page 15). Learning to cast with fly tackle is somewhat more difficult than leaming to use a spinning or bait-casting outfit. 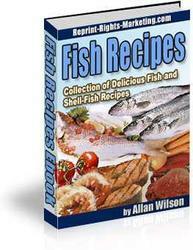 However, most fishermen can leam the basics of fly-casting in a few homs. Some flies can be fished fairly well with spinning or bait-casting tackle, but you must use a plastic bubble for casting weight. With fly-fishing tackle, the casting weight is supplied by the line rather than the lme. Yoh must use a line heavy enough to overcome the wind resistance of the fly you select. But if the line is too heavy, it will hit the water too hard and spook fish. 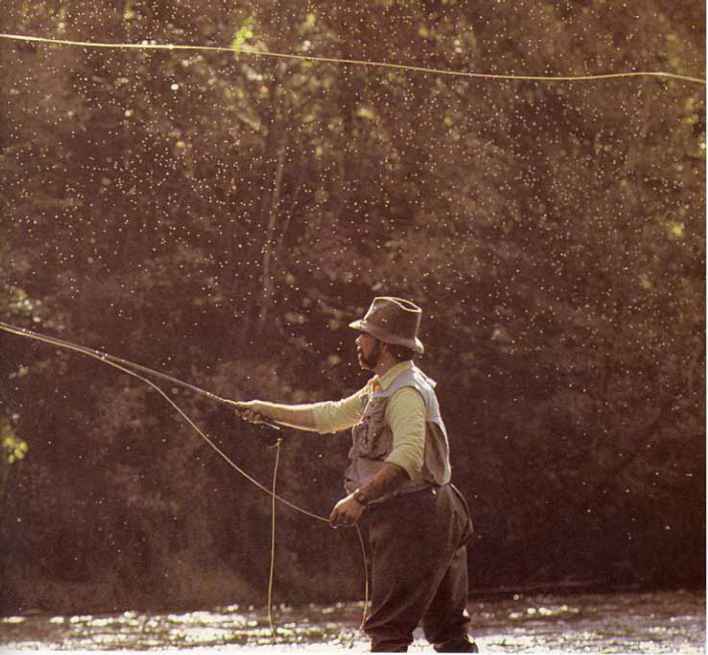 The following chart gives rod- and line-weight recommendations for the major types of fly fishing. When fish dimple the surface on a warm summer's evening, no other lure works as well as a dry fly. Fish often refuse anything but an insect imitation when a major hatch is on. The body of a dry fly consists of yarn, fur, feather quills, clipped deer hair or tinsel tied around a light-wire hook. The hackle is formed from a neck feather of a rooster. It resembles the legs of an insect and helps support the fly on the water. The majority of dry flies have a tail, made of hair or feather fibers, which also helps support the fly. Most have wings, made of feathers or hair, which make the fly more visible to the fisherman. Upright wing - The most common type of dry fly, this style has standing wings resembling those of a live mayfly. The wings are usually made from feathers, hair or translucent fabric. Spent wing - This type imitates a dead mayfly, which drifts on the water with its wings spread. Most have wings made of hackle tips. Down wing - These flies drift with wings folded along the body, much like a caddisfly or stonefly. The wings are generally made of hair, but some are made of feather sections. Bivisible - Usua11y wingless, a bivisible fly has hackle along the body from head to tail, making it a high floater. The hackle in front is white, so the fly can be easily seen by the fisherman. The rest of the hackle is dark and imitates insect legs. Spider - Another wingless fly, a spider has hackle much longer than normal and a short, slender body. It alights softly on the water and floats high. Parachute- The hackle on this fly is wound around the base of the upright wing rather than around the body. Parachute flies land softly, but float low in the water, giving them a realistic appearance. No-hackle - These flies have a polypropylene body that provides flotation. Most have upright or spent wings made of feathers, hair or synthetic fibers. These realistic flies work well for highly selective trout in still water or slick current. But they float so low in the water that they are difficult to see. In rough water, they will sink. Most dry-fly patterns may be tied in reversed style, with the hackle at the bend of the hook, and the tail at the eye. Tied this way, a fly floats better because the hackle supports the heaviest part of the hook. The most important consideration in choosing dry flies is to imitate the size of the hatching insect. Under most circumstances, you do not need to precisely match the shape and color. Other considerations include buoyancy, durability, delicacy, and visibility to the fisherman. The faster and more turbulent the water, the more difficult it is to keep your flies afloat. 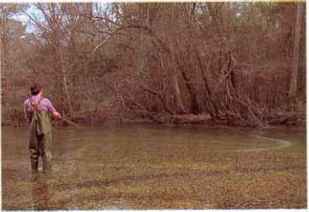 For best flotation, select flies with bushy hackles, and bodies or tails made of deer hair or other buoyant materia1. Hackles wrapped full length along the body, or Palmer style, also increase the buoyancy. Flies tied with hair wings and tails are most durable. Those with feather wings, especially fan wings, or with hackle-fiber tails are most easily damaged. You need a durable fly for large fish like steelhead and salmon. When fishing is fast, a durable pattern enables you to catch many fish without changing flies. A delicate pattern works best under conditions where fish can clearly see the fly. In extremely clear water and slow cunent, trout and salmon often refuse bushy patterns, because they do not closely resemble real insects. Patterns with sparse hackles and tails and slender bodies are most effective. To know when to set the hook, you must be able to see your fly. Light-colored flies usually show up best in dim light. But you can see a dark fly better when facing into a low sun. High-floating flies are easier to see than those that ride low in the water. When fishing at night, set the hook at the sound of a rise. 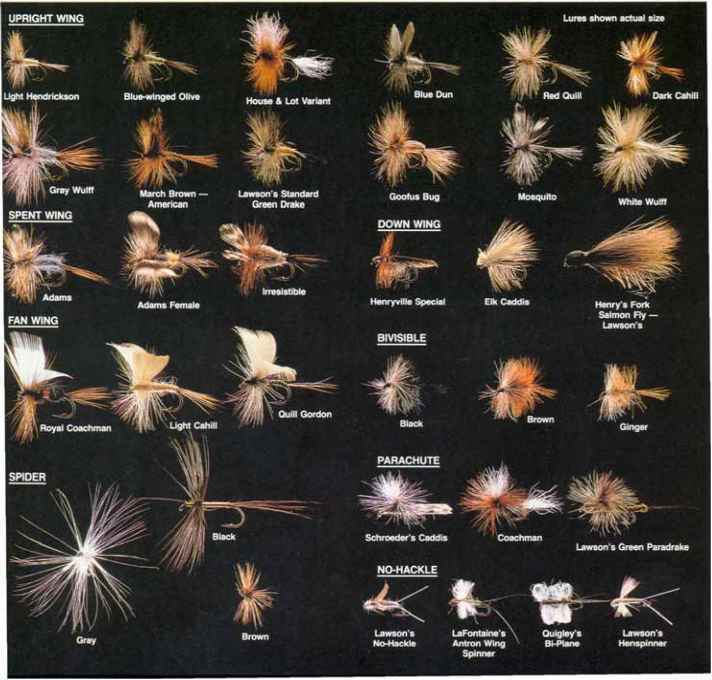 TYPICAL DRY FLIES consist of (l) head, (2) hackle, (3) wings, (4) body, and (5) tail. POPULAR STYLES of dry flies include the following: (1) upright wing, (2) spent wing, (3) down wing, (4) fan wing, (5) bivisible, (6) spider, (7) parachute, and (8) no-hackle. The challenge in dry-fly fishing is not only to select the proper fly, but also to present it so it appears like a real insect on the water. A lifelike presentation is most difficult in moving water. A real insect drifts at the same rate as the current. But a fly attached to a line and leader will not drift naturally unless carefully manipulated. When the line prevents the fly from drifting at the same speed as the current, fish usually refuse to strike. This unnatural pull on the fly is called drag and is the most common problem in dry-fly fishing. To achieve a drag-free drift, make a slack-line cast. Wiggle the rod tip from side to side before the fly alights, so that the line will fall to the water in tight S-curves. The fly will drift without drag until current takes the slack out of the line. When the slack is gone, you can pick up the line and cast again, or mend the line to continue the drag-free drift. Drag-free drifts are easiest if you keep your casts short, no longer than 40 feet. 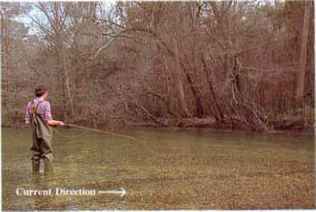 You can also minimize drag by angling your casts upstream or downstream, rather than across stream. Avoid casting directly upstream because the line will drift over the fish before the fly does. When fishing upstream, strip in line quickly enough to keep up with the speed of the current. 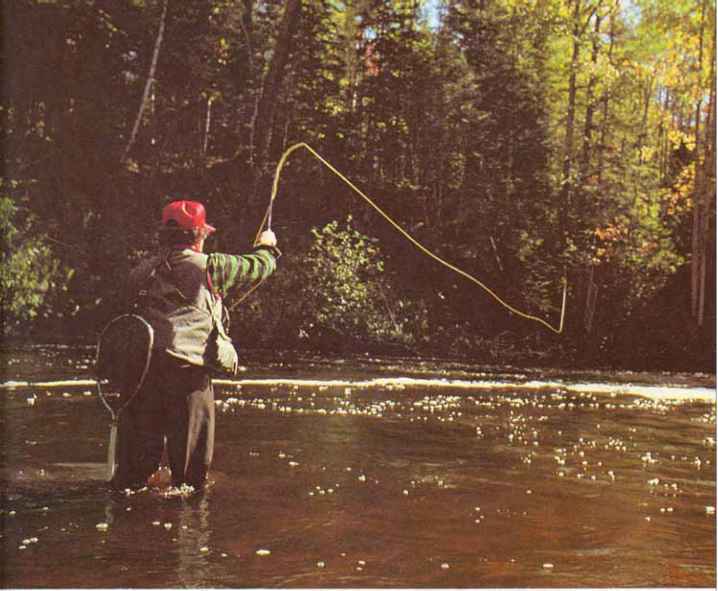 When fishing downstream, you must feed line at the same speed as the current. ALLOW your fly to drift downstream until the belly in your line becomes large enough that it begins to drag the fly faster than it would normally float. You can increase the length of the drag-free drift by angling your cast farther upstream. imitates one of these insects, occasionally skip it a few inches by lifting and twitching the rod tip. Lower the rod to resume the drag-free drift. The best time to use a dry fly is when you see fish rising. But a swirl does not necessarily mean that fish are feeding on the surface. Instead, it may indicate a fish taking larval insects below water. In this case, a wet fly or nymph would be the best choice. A true rise willleave a small bubble on the water, caused by fish sucking food from the surface. Always cast well upstream of a rise. Remember that between rises, a fish lies several feet upstream of the spot where the rises appear. By the time a fish spots an insect and swims upward to grab it, the fish is well downstream from its lie. After it takes the insect, it retums to its original position. On a still pool, lake or pond, try to cast so that the fly lands directly on the rise. Or, if a fish seems to be moving, watch the pattern of rises, then cast ahead to intercept it. Trout and salmon fishermen often make the mistake of reacting too soon when a fish rises. Do not try to set the hook when you first see the rise, but wait an instant longer to be sure the fish has taken the fly. Because dry flies are generally fished with light tippets, you must set the hook with a smooth lift of the rod. If you snap your wrist, you may break the leader. The small hook on a dry fly penetrates easily, so there is no need for a powerful hook set. Most fishermen prefer dry flies from size 10 to 22 for trout, 10 to 12 for panfish, 2 to 8 for Atlantic salmon and steelhead, and 4 to 6 for smallmouth bass. When fishing dry flies, always use a floating line, either weight forward or double taper. Leaders should be long, from 7Y2 to 15 feet. MEND your line by pointing your rod in the direction of the belly, then sharply flipping the rod to roll the line upstream. The belly will point upstream; the fly remains on the water. Continue the drag-free drift until the downstream belly reforms, then mend the line again. FALSE-CAST to dry your fly after a drift. Make several casting strokes backward and forward before allowing the line and fly to settle to the water. Even when treated with floatant, a dry fly will absorb some water. TREAT your fly sparingly with a paste dressing for best flotation. Be sure your fly is dry before applying the dressing. If not, dry it with a powdered dessicant. RUB mud, saliva or commercial leader-sink on your tippet to make it sink. The rest of the leader should float. A sunken tippet is less visible to fish than a floating one. LOOK for clues that reveal the type of insect fish are eating. Inspect spots where insects collect, like spider webs and bushes. Select a fly similar to the insects you find. Can you use a stonefly as fishing bait? How to cast a crankbait style fly lure? Which is better for crappie jigssaddled or neck hackle?